I simply love the crumbly texture of this Thumbprint Cookies. 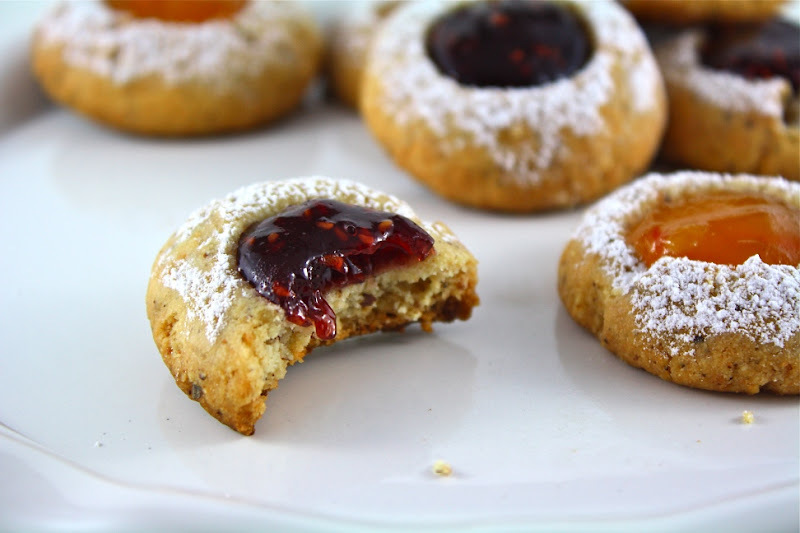 Make these cookies and fill them up with your favorite jam. This recipe uses hazelnuts; but, you can play around with almonds or even walnuts. So, do try the recipe and happy baking. Position the racks to divide the oven into thirds and preheat the oven to 350˚F. Line 2 baking sheets with parchment or silicone mats. Whisk together the ground nuts and flour. Working with a stand mixer, preferably fitted with a paddle attachment, or with a hand mixer in a large bowl, beat the butter and sugar together on medium speed until light and fluffy, 3 to 4 minutes. Add the extracts and beat to blend. Reduce the speed to low and gradually add the nut-flour mixture, mixing only until it is incorporated into the dough. Working with a teaspoonful of dough at a time, roll the dough between your palms to form small balls and place the balls 2 inches apart on the baking sheets. Steadying each cookie with the thumb and a finger of one hand, use the pinkie of your other hand (or the end of a wooden spoon) to poke a hole in the center of each cookie. Be careful not to go all the way down to the baking sheet. Bake for 15 to 18 minutes, rotating the sheets from top to bottom and front to back at the midway point. The cookies should be only slightly colored-they might even look undone, which is fine: they should not be over baked. When the cookies are baked, remove the baking sheets from the oven and let the cookies rest on the sheets for 2 minutes before transferring them to cooling racks with a wide metal spatula and sifting confectioners’ sugar over them. Repeat with remaining dough, remembering to cool the baking sheets before baking the next batch. Bring the jam to a boil in a small saucepan over low heat, or bring to a boil in a microwave oven; remove from the heat. 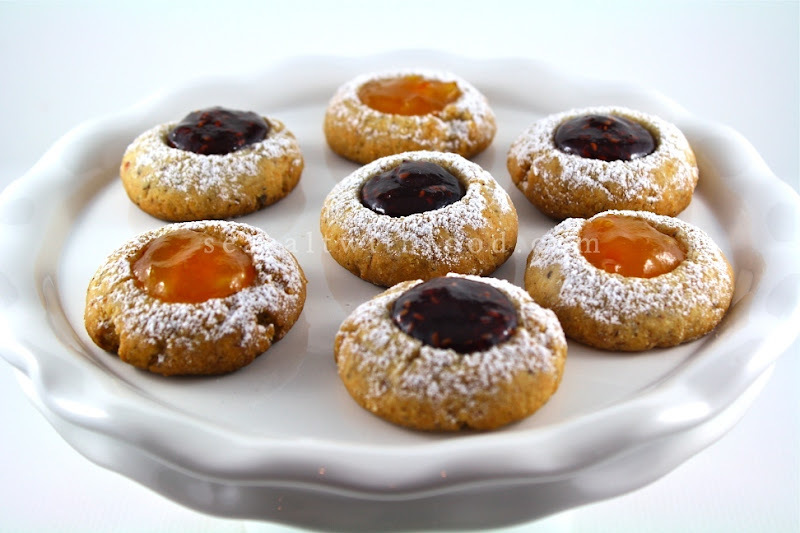 Fill the indentations of all the cookies with enough of the hot jam to come level with the tops. Cool to room temperature. oh yum! 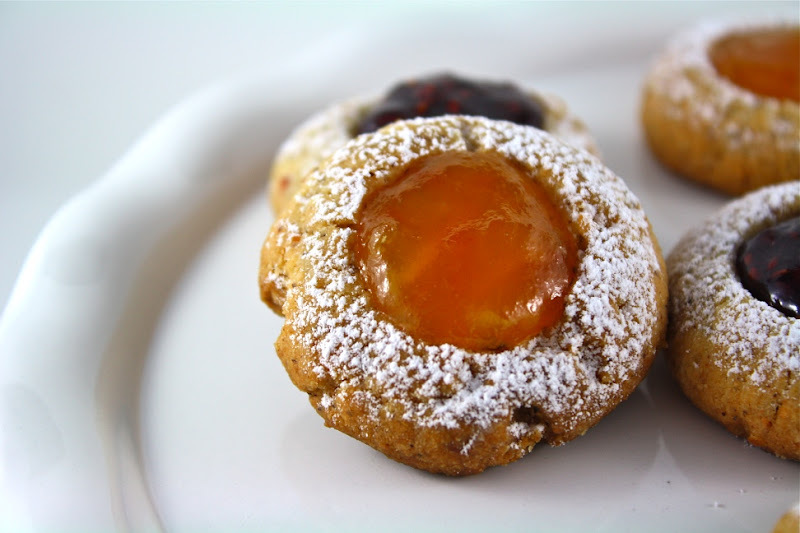 thumbprint cookies are one of my favorites, but I've never had them with hazelnuts before. LOVE hazelnut. These look so good! I love thumbprint cookies! I have some that I'll be finishing up tomorrow with chocolate filling. there's something missing from your recipe, I had to add an egg to get the mixture to stick together. @Anonymous: Just checked, there's no egg in this recipe. Thanks.